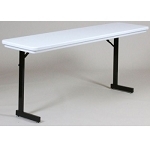 Seminar Tables | Conference Tables | Folding Tables. 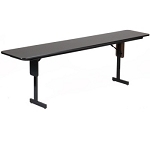 Seminar tables from National Public Seating and Correll, Inc. provide an excellent solution for schools, churches, and businesses to give those seated at the table enough space for writing and reading materials without occupying too much space in the room. 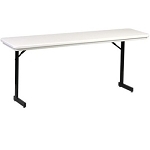 National Public Seating conference tables and some Correll conference tables feature a plastic table top and a steel frame. Other Correll seminar folding tables feature a wood-core laminate table top and a steel frame. Order your seminar tables here. What is a wood-core composite laminate table top on Correll conference tables? The wood-core laminate table top is sometimes referred to as engineered wood. This material is made from fibrous roots from various plants and is compressed and sealed into a hardened structure as you see on Correll, Inc. tables. 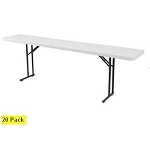 This material for the table top generally provides a smoother surface than blow-molded tables tops for conference folding tables, making them easier to write on. Engineered wood tables tops are also typically heavier than comparably-sized plastic table tops.